AN ENCORE FOR ALLEGRO: Could Rodgers & Hammerstein's ALLEGRO finally be coming into its own? Its challenging, innovative form has made ALLEGRO controversial ever since it opened on Broadway in 1947. While it has been called Rodgers & Hammerstein's most adventurous work, such recognition has not always translated into box office success for the musical. Now, however, might fans and customers alike heed its clarion call to "Come Home," discovering for themselves the musical that Stephen Sondheim (its original production assistant) has called "the first really good experimental show"? For those who had gotten no closer to ALLEGRO than the photo essays and analysis in Ethan Mordden's definitive Rodgers & Hammerstein (Harry N. Abrams, Inc., 1992), or the authentic but severely truncated original cast album on RCA Victor, the first weekend of March provided a golden opportunity: for the first time on the professional stage, ALLEGRO returned to New York. 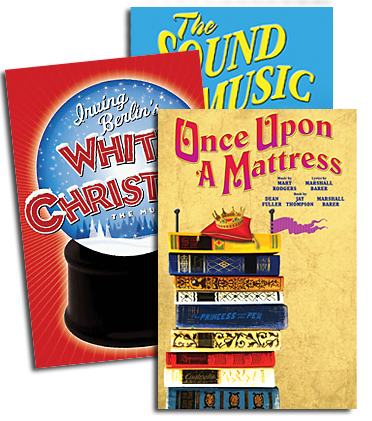 Offered as the second of three musicals in City Center's inaugural season of ENCORES! GREAT AMERICAN MUSICALS IN CONCERT, ALLEGRO was directed by Susan H. Schulman and conducted by Rob Fisher. While billed as a concert, this presentation was atypical of the format, just as the original production of ALLEGRO had challenged the accepted norm of musical theatre. Here, the orchestra was in the pit, a series of platforms and screens were placed across the stage, and, in a direct homage to the original production's innovative designs and projections by Jo Mielziner, director Schulman called on the talents of Wendall K. Harrington. For TOMMY the previous season, Harrington's brilliant use of multi-media imagery had earned her a host of accolades. For ALLEGRO, she projected a series of photo stills and visual montages that offered thematic and plot continuity throughout the evening, as well as two fascinating and historical set pieces at the beginning of each act: the first, during the overture, used photographs of the original production to set ALLEGRO in its context in musical history while offering a glimpse of its astonishing staging, while the second, shown during the entr'acte, paralleled the action by taking the audience from the close of World War I through the roaring '20s and into the Depression. Schulman, Fisher and Harrington received further technical and artistic support from designers John Lee Beatty, Richard Pilbrow and Dawn Chiang, and choreographer Lar Lubovitch. The four performances of ALLEGRO were held from March 2 to 5, and featured a first-rate cast. Stephen Bogardus was the Everyman protagonist, Joe Taylor, Jr.; Donna Bullock was his ambitious wife, Jenny; Karen Ziemba his college flirt, Beulah; Christine Ebersole his loyal nurse, Emily; Jonathan Hadary his sidekick Charlie; with John Cunningham and Carolann Page as his parents, and Celeste Holm as his grandmother. Fisher conducted the Coffee Club Orchestra, utilizing the original Robert Russell Bennett orchestrations, with dance arrangements by Trude Rittmann (not heard in their entirety since the original production, Rittman's arrangements were hailed by Michael Feingold in the Village Voice as "miles ahead of anything similar in the R&H canon"). Christopher Reeve served as narrator, and at the first performance was joined by a special guest, Stephen Sondheim, who regaled the audience with anecdotes from the out-of-town tryouts, and offered eloquent praise for the craftsmanship of his mentor, Oscar Hammerstein II, citing his own and Hammerstein's absolute devotion to ALLEGRO. "If there were any doubts about the absolute necessity for Broadway buffs of ENCORES!," wrote Michael Kuchwara for the Associated Press, "they have been dispelled by ALLEGRO." Feeling that ALLEGRO "strikes a powerful chord," Daily News critic Howard Kissel also said, "One leaves this performance with renewed admiration for Rodgers and Hammerstein's daring." Martin Gottfried in the New York Law Journal acknowledged that ALLEGRO "aspired to more than it achieved," but nevertheless praised it for its "charming score and the suggestion of Broadway developments to come." In an enticing commentary, Billboard's Irv Lichtman asked, "How many failures can boast four strong ballads: 'The Gentleman is a Dope,' 'So Far,' 'A Fellow Needs a Girl,' and 'You Are Never Away'? How many new musicals enjoy one ballad that equals any of the four?" Critical appreciation for the risks taken in ALLEGRO was also widespread; Stephen Holden in the New York Times called it "an aggressively innovative show," Jan Stuart of Newsday said it was "Rodgers and Hammerstein's most adventurous work to date," and Jeremy Gerard of Variety declared it "a brave music theatre experiment." This "experiment" was originally a commercial failure. But the complexity of its score, and the evident determination of its authors to push the artform into uncharted territory, makes ALLEGRO irresistible to serious students of the musical theatre. And it is they, hopefully, who will share it with even wider audiences. For information regarding performance rights to Allegro, please contact The R&H Theatre Library by phone (212/564-4000) or fax (212/268-1245).